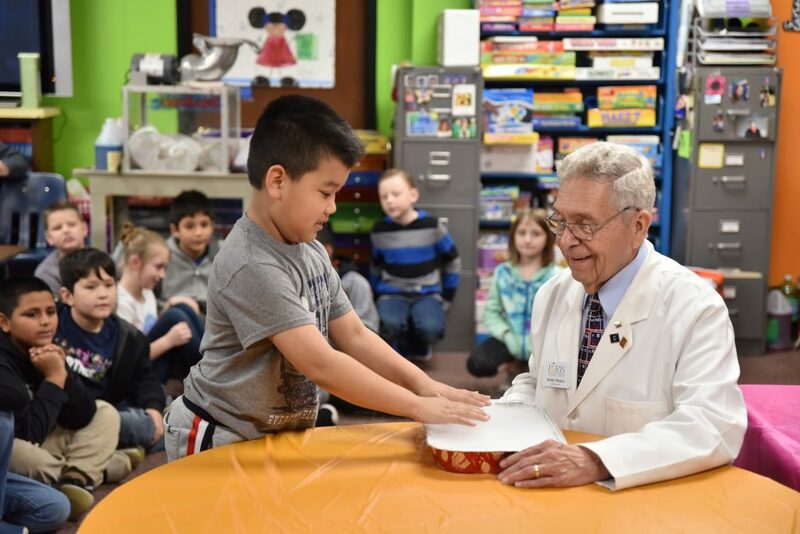 Lamar County Chamber of Commerce Ambassador Bobby Walters, and his assistants, Becky Semple, and Gina Crawford, participated in Science Day at Everett Elementary by showing JoNel Eads’ and Marla Hart’s third graders a number of science experiments. One experiment, in particular, wowed the students. Walter demonstrated what happens when warm water is poured over dry ice. Students learned that dry ice never enters a liquid state as it melts but transforms to gaseous carbon dioxide. Above, Toby Trinh hovers his hands over the fog created by the experiment. Walters, who is now retired, taught chemistry at Paris High School and Paris Junior College before becoming dean, vice president and president of PJC. He now volunteers at the Chamber of Commerce and Visitor Center loves to meet people and encourages young students in the field of science.